Passengers with destinations in Uptown can expect a more convenient trip when Bus Route 27 begins operation on a new detour routing, effective Tuesday, January 2, 2018. Buses leaving West Transfer Center will travel current route to Moody and McKinnon, then turn left on Hunt, right on Harwood and right on Wolf back to current route on McKinnon. 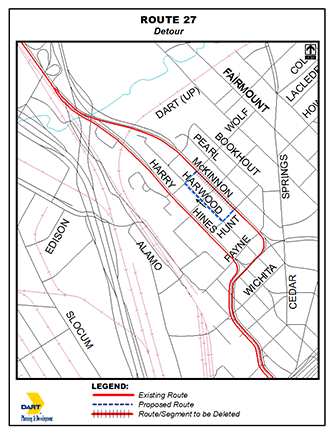 Bus stops will be installed on Hunt at Harwood and on Harwood at Wolf to serve new developments in the area. Southbound routing, as well as the customer schedule, will remain unaffected. The detour is expected to become a permanent part of the route when system-wide service changes take effect on March 26, 2018. Thanks for riding DART.